Go Margin™ enables buyers and sellers to easily calculate their expected sales and profit margin. 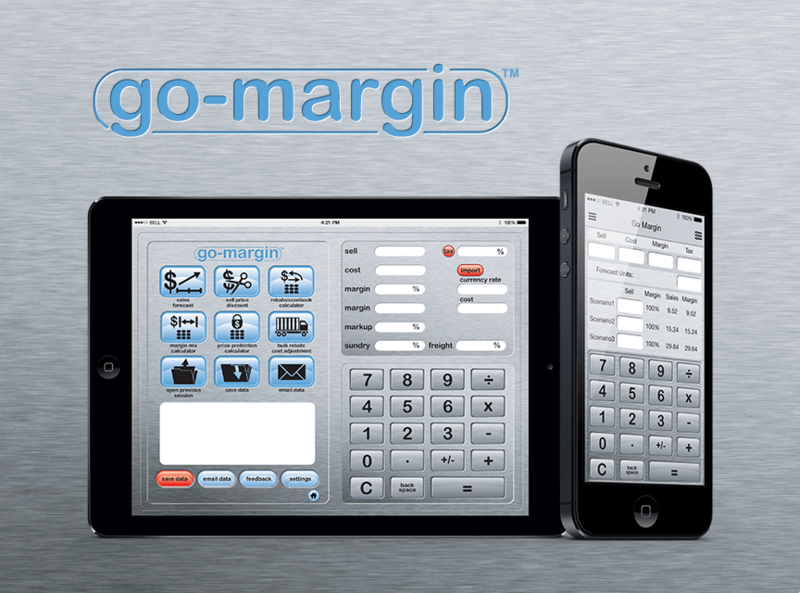 Go Margin™ is more than just a margin calculator. Using the cost and sell prices, you are able to forecast potential sales and discounts with multiple scenarios on screen. If you work with rebates or free stock, Go Margin™ also allows you to ensure your existing stock is looked after when you are in negotiations. As a meeting tool, Go Margin™ allows you to make effective decisions quickly ensuring all parties are on the same page. Sales Forecast Calculator: Calculate your potential sales and margin based on your cost price and multiple sales scenarios. Sell Price Discount Calculator: Calculate your potential sales and margin based on your cost price and discounted sell price. Rebate/Scan-back Calculator: Calculate your required rebate based on an expected margin. Margin Mix Calculator (Weighted Average Cost) Calculate your new average cost price based on the cost and quantity of the new stock. Price Protection Calculator: New Cost Price? Calculate your required rebate for your existing stock. Bulk Rebate Cost Adjustment Apply a bulk value to your existing stock and calculate your new cost price and margin.